The role of the electromagnetic brake in the brake control solenoid from many different types: according to it, and brake with the trip points can be divided into long stroke and short stroke solenoid brake braking power classes of iron; according to the type of power can be divided into DC and AC brake solenoid brake solenoid, AC brake solenoid is divided into three-phase single phase brake solenoid and brake solenoid two. By core excitation coil can be divided into series and shunt excitation brake solenoid brake solenoid; by way of the armature movement can be divided into direct-acting braking and turning into iron brake solenoid ; according to the different ways to pass the most points, can be divided into direct transmission (mechanical transmission) and indirect transmission solenoid brake (hydraulic transmission) brake solenoid. 1, AC short stroke brake electromagnetic solenoids. MZD1 short stroke solenoid to turn the AC brake type, often associated with TJ2-type brake shoe supporting the use of components of electromagnetic mechanical braking device. When the solenoid coil power. Ⅱ-shaped armature and pull around the axis of rotation, and together with the drawbar link to the right of the brake system, brake control brake to complete the action. When the coil power, the armature rod of the reaction by the benefit system release, the release plate to determine the location of the stop, stop plate by the steel composition. 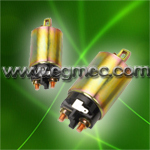 2, short-stroke DC brake electromagnetic solenoids. MZZ1 DC brake solenoid short trip from the steel shell, shell armature and wrapped in the coils, shell open vents. When the coil is energized, the armature is attracted, the suction transmitted through the drawbar traction brake rod, complete brake brakes bring the action. Often associated with TZ2 model supporting the use of shoe-type brake, electromagnetic brake components normally closed, are widely used in material handling equipment, the speed limit down objects. 3, AC long stroke brake electromagnetic solenoids. AC solenoids are generally made of long stroke linear motion armature type. AC long stroke brake solenoid to MZS1 represented. It consists of the armature, coil, core, drawbar, etc., the composition of its shell with a welded steel plate. To improve the mechanical life, large brake solenoid, such as MZS1-25H, MZS1-45H and MZSI-89H, both with a buffer. 4, DC long stroke brake solenoid. MZZ2-H DC is mainly used for long stroke brake shoe brake solenoid, it works the same with AC brake solenoid.